The key objective of CREATEABILITY 2017 is to profile work produced by artists with disability through identified arts organisations and screen media. NEWSFLASH: Createability Series 1 has been purchased by Virgin Australia to screen on all domestic and international flights as part of their inflight entertainment from January till June 2018. We would like to acknowledge the work and support of Victoria Baldock of Verve Entertainment in securing the Virgin Australia Inflight Entertainment opportunity. Last Friday 1st December, we launched this years 8 Createability films to a very receptive audience at Artstate in Lismore. Artstate is a new four year project by Regional Arts NSW designed to shine a light on excellence in regional arts practice. Most of the filmmakers were in attendance and so were able to introduce their films in person, often with their profiled artists at their side. We started the night with a live performance from Grace Hickey – the talented singer/songwriter profiled in ‘Grace on Fire’ – whose beautiful voice set us up brilliantly for a great evening. The night was a celebratory one and there a was a lot of gratitude and love in the house! To mark this year’s International Day of People with Disability on Sunday 3rd December, eleven poignant and beautiful stories of regional artists with disability will be broadcast on ABC and ABC iview from Monday 27th November. These short films are part of CREATEABILITY a program initiated by Screenworks to showcase artists with disability living and creating across regional NSW. Ghost in the Machine, featuring Lismore artist Jeremy Hawkes, created by HW Collective, Bangalow, NSW. Order from Chaos, featuring painter, Verity Nunan from Byron Bay, NSW created by Nathan Wood and Clementine Bourke also from Byron. Drawing for Purpose, featuring illustrator Stephen Williams from Wagga Wagga, NSW, created by Steve Moore and Alexis Neylan of Mayfly Media in Wagga. Making Waves, featuring dancer Max McAuley from the Northern Rivers, NSW, created by Karenza Ebejer of Lismore, NSW. Wayne at the Factory, featuring Wayne Emerson, a painter from Wagga Wagga, NSW, created by Ainsley and Damien Jenkins of Next In Line Films, Wagga Wagga. Meeting Mick, featuring writer Tim Winton-Brown and dancer-artist Mick Parr from Nimbim, NSW, created by Susie Forster from Ocean Shores. Grace on Fire, featuring singer-songwriter, Grace Hickey from Yamba, NSW created by Deb Novak, also from Yamba. A Spiral Mind, featuring jewelry artist Kurt Saggers from Albury, NSW, created by Helen Newman of Nomad Films in Albury. Acting ABC NSW Regional Editor, Justine Frazier, said that the broadcaster is proud to share the stories of regional artists with a disability who are making a difference in their local communities and within the arts sector. “ABC Regional’s mission is to give a voice to the one-third of Australians who live outside of our capital cities so that their stories can be shared within their communities and with the nation. The depth of the ABC’s commitment to regional Australians with disability is enforced by our involvement in initiatives such as Createability, and the ABC Regional Storyteller Scholarship, which was announced last month”. All principal filming for Createability 2017 is complete. This means that we, in the Screenworks office, will soon be in the enviable position of reviewing the edits as they come in and thats a really enjoyable part of this initiative. Scroll down to review some behind the scenes photos from the film shoots across the region…. Mac McAuley and Karenza Ebejer (Lismore): Dancer, Max McAuley and Director, Karenza Ebejer have chosen a few different filming locations to show off Max’s skills. Here you’ll see the crew filming at Goonellabah swimming pool and in Lismore laneways – just a couple of the locations you’ll see in the final film. Stephen Williams and Mayfly Media (Wagga Wagga): Steven and Alexis of Mayfly Media have been filming Stephen Williams in his home studio, working to capture the fine detail and patience required to produce one of his pencil drawings. 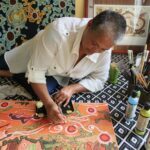 Mbatha Nguta and Darius Devas (Byron Bay): Darius has spent his days with painter Mbatha, filming him in his element in the art and dance studios at Red Inc. Lismore. This film promises to be as colourful as Mbatha’s artworks. Kurt Saggers and Helen Newman (Albury): Director, Helen followed jewellery artist Kurt to one of his digging sites to search for some interesting materials. We will also witness Kurt in his studio transforming his finds into delicate trinkets. Grace Hickey and Deb Novak (Yamba): Deb has chosen to showcase the beautiful environment of Yamba and surrounds whilst telling Grace’s story of her love of music and songwriting throughout this film. Fingers crossed the drone shot makes it into the final edit. Mick Parr, Tim Winton-Brown and Susie Forster (Ocean Shores): Director Susie hopes to complete her final day of shooting out at dancer Mick’s impressive home close to Protestors Falls in the next week. Susie and her DOP, Annie Benzie successfully rigged the car to film presenter/writer Tim’s journey out there. We can’t wait to see this one. Ainsley Jenkins and Wayne Emerson (Wagga Wagga): Director Ainsley of Next in Line Films has been interviewing Wayne and filming him whilst he paints in his artists studio, The Art Factory, Wagga. They also took advantage of a break in the rain to film in his garden, documenting his love of birds. Bec Hogan and Dom Freestone (Newcastle): Bec finished her filming with graphic artist Dom pretty swiftly as she has a lengthier post process planned than most of our Createability films this year. From what we’ve seen so far, Dom is coming across as a really talented creative. Wayne Emerson is a painter and textile artist who has exhibited for more than 30 years in Wagga Wagga. Wayne’s artwork conveys an affinity with the natural environment. His subject matter includes animals, Australian birds, plants and waterfalls. Wayne has exhibited at the Wagga Wagga Art Gallery, The Regional Arts Australia Conference Artlands Dubbo and the Riverina Community College. Wayne works weekly at the supported studio The Art Factory. Ainsley Jenkins of Next In Line Films is profiling Wayne for Createability. Bec Hogan is profiling Dom for Createability. Mbatha Nguta from Lismore is a Kenyan Australia who became severely brain damaged after an oxygen deprived birth. Mbatha has never been able to speak. When he was a child, Mbatha discovered painting and colours and his whole world changed. Since leaving school his abstracted artworks have garnered national recognition for their bold and distinctive style. Everyone who has witnessed Mbatha in his studio say it is a sight to behold; his process to create his works is a piece of art in itself. Mbatha has compensated his inability to communicate with a powerful ability to express himself through his art. He is a wonderful example to show that someone can find a voice even if they cannot speak. He is a practicing artist at Red Inc.
Darius Devas of Being Here Films is profiling Mbatha for Createability. Kurt Saggers is an artist based in Albury in southern New South Wales; he grew up in the region and is happy to call it home. Kurt was diagnosed with bipolar in 2009. When he is not in the studio creating Kurt is a spokesperson for Mind Australia. Kurt The Cat on Facebook. Helen Newman of Nomad Films is profiling Kurt for Createability and Kurt will earn a writing credit for the film. Karenza Ebejer of Moving Image Media is profiling Max for Createability. Stephen uses Facebook and Instagram to sell his works. Steve Moore and Alexis Neylan of Mayfly Media are profiling Stephen for Createability. In 1996 Mick Parr, a man in a wheelchair (although anything but confined) surprised everyone with his nimble ability to move himself through space and into the hearts of an audience. Tim Winton-Brown met Mick in 1998 during a disability dance class at Company Chaos in Lismore following his quadriplegic spinal injury in 1998. Soon they were performing together on stage. A Churchill Fellowship for Mick followed and one of his dances opened the Arts section of the 2002 Commonwealth games in Manchester. Mick has travelled the world with his interest in dance for several years. He has completed a Diploma of Visual Art through TAFE and now continues his interests in art and sculpture. Tim completed his Bachelor of Journalism through the University of Queensland in 2002 and later completed a Graduate Diploma of Applied Law in 2012. He has continued his interest in dance throughout this time will gain producing and writing credits for this Createability film. Susie Forster of Byron Bay Multimedia is profiling Mick and Tim for Createability. Since our last post, the eight regional Createability filmmakers have been busy honing their shooting scripts and meeting with their experienced local ABC Open Producers in script clinic sessions. All shooting scripts need to be signed off before the filmmakers can start spending their funding money and proceed with principal photography. It has been fascinating to read the incarnations of each script throughout this approval stage and only serves to make us more eager to see those first cuts in mid August. Shooting will start for many of the 2017 Createability films in the coming weeks. 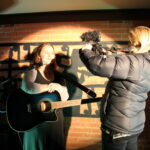 “I can’t wait to get started on this film and I’m very excited” Susie Forster, Ocean Shores. To the right, you’ll see 5 of our 8 filmmakers during their script clinics. Please watch this space as we announce all our featured artists over the next few weeks. We are very excited in the Screenworks office today as we announce the 8 regional filmmakers and projects that have been selected to be part of Createability 2017. Scroll down to find out more about this years recipients of Createability funding, each filmmaker will recieve $5000 to make their short films. The full media release can be accessed via this link. Please watch this space, we will be introducing our regional artists over the coming weeks. Poppy Walker and Sophie Hexter’s 2015 film, The Battle has been selected to show at 29 Filmfest Dresden 2017 (Dresden Short Film Festival, Germany). Their 2016 film The Ghost in the Machine will have its international premiere in Germany at the Cellu l’art Film Festival, 2017 and has been accepted into the Melbourne Documentary Film Festival. Nathan Wood’s film, Order From Chaos has also been accepted in to the Melbourne Documentary Film Festival. Applications for CREATEABILITY 2017 closed at midnight on April 23rd 2017. Thanks to all who showed interest in this years project, keep checking back to see how the initative progresses. Let the deliberations begin! This year Createability harnessed the power of the internet to broadcast the ABC Open Pre-ProductionMasterclass via Facebook LIVE. It was mandatory for all filmmakers applying for Createability 2017 to watch the masterclass via the ABC Open Facebook page and this could be done live or post the event. ABC Open and Createability Series Producer Anthony Scully was joined on screen by Hunter-based filmmaker Nicky Elliott, who made ‘Pearl Red Moon’ for Createability 2016. Between them they talked through case studies and provided invaluable tips on how to submit an engaging and viable storyplan to Createability 2017. We at Createability HQ were able to respond to viewers questions during the Facebook LIVE broadcast in the comments section in real time. The future is here! 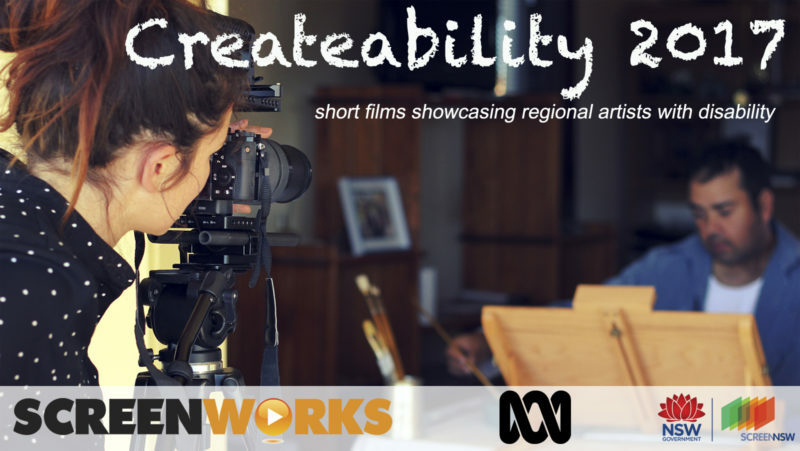 CREATEABILITY 2017 is a Screenworks initiative supported Screen NSW and the ABC that provides funded opportunities for professional filmmakers living in Regional NSW to profile artists with disability living and creating in their communities. Screenworks has funding available for 8 filmmakers to produce 8 films in total. Each film will between 3 and 7 minutes and will profile an artist with disability who resides and creates in Regional NSW. Filmmakers with disability are strongly encouraged to apply for this program. All filmmakers selected for this program will be strongly encouraged to connect with and to include emerging filmmakers with disability from regional NSW as part of their team. Opportunities may also include mentorship, skills development, industry networking and/or creative collaborations, with a view to help enable collaborations and project teams for future projects. CREATEABILITY 2017 is not an entry-level initiative for filmmakers. All applications must first meet the following eligibility criteria in order to complete the application process. Applications are only open to Australian citizens or residents living and working in Regional NSW. This is defined as all of NSW excluding Sydney Metropolitan, the Blue Mountains and the Central Coast. These materials will be assessed by an independent panel and a final decision made on the successful applicants during week commencing 8th May 2017. Each successful filmmaker will be allocated a budget of $5,000 excluding GST to produce a short film up to a maximum length of 7 minutes. As part of the application process, each filmmaker will need to clearly demonstrate how the $5,000 budget will be spent. 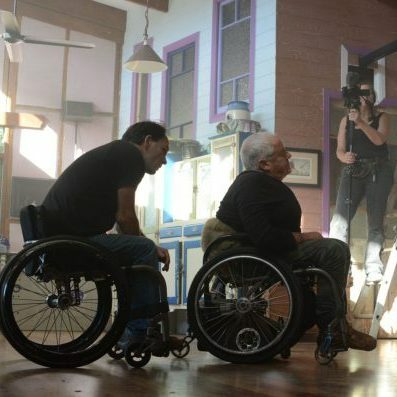 When considering the budget, each filmmaker must include information about the accessibility components that will be included in their short film. Project funding is provided as a grant. If you are successful, Screenworks will enter into a written agreement with you, specifying the terms of the funding and what you will need to deliver in order to receive payments. All projects selected for production will be subject to editorial guidelines and must comply with editorial feedback provided by Screenworks and/or the ABC. The successful filmmaker teams will be required to grant Screenworks, the Australian Broadcasting Corporation (ABC) and the NSW State Government agencies (such as Screen NSW) a non-exclusive, worldwide, royalty free licence to use the short film for its own corporate or promotional purposes including but not limited to use on websites, newsletters and/or annual reports for perpetuity. Screenworks reserve the right to approve production budgets prior to contracting. If you are one of the 8 selected filmmakers you will be required to work with an appointed ABC Producer to engage with your subject artist, to develop your storyline and produce a shooting script for approval before commencing pre-production and principal photography. This will be through face-to-face script clinic meetings, telephone conversations and email correspondence. Each key deliverable stage e.g. : script, edit, fine cut will require the approval of all stakeholders before progressing to the next stage. Quality of the application material. Quality of the story & treatment of subject matter. Track record and previous experience of filmmaker. Ability of the filmmaker to deliver the film on-time, budget and to a high standard. Filmmakers interest in the project and how filmmakers with disability can be included in the project. Screenworks may also take into consideration whether the applicants have a number of concurrent outstanding projects in development or production that may impact on the quality. Screenworks and the ABC intend to promote this project through multiple channels including promotion to local regional media via press release information and on social media channels. There will also be project page updates on the Screenworks and ABC websites to detail the project. Each filmmaker selected will be expected to support and co-operate with Screenworks and the ABC to ensure that it is able to achieve the project promotion objectives set out above. Where a filmmaker chooses to submit their film in to Australian or international film festival, any entry fees will be the responsibility of the filmmaker. All Createability 2017 applications for funding must be submitted by midnight (AEST), Sunday 23rd April 2017. An application receipt will be emailed to all applicants within 3 business days of submitting your application. If you do not receive a receipt email, you should contact Screenworks on (02) 6687 1599 to confirm that your application has been received. Applications must be submitted using the online application form. Applications submitted by other methods will not be accepted. If you experience any difficulty with the online application, please contact Screenworks Project Coordinator, Louise Hodgson on (02) 6687 1599. Screenworks are strongly committed to increasing diversity across all sectors of the screen industry. We encourage all talented filmmakers to apply to our programs regardless of their gender, race, religion, sexual orientation or disability status. CREATEABILITY 2017 is supported Screen NSW and is being delivered in association with the ABC.